Search Results for "spin wheel"
Feet of inline skater, motion. Rollerblades and sun. Let them wheels spin. 1970s: Boy spins wheel to Wood. A logging truck with cut trees drives by. The wheel spins to Forage. Cowboy rounds up cattle on forest land. Wheel spins to Wildlife. Girl Talks to Friends and Looks at her Nails. Girl Spins Bike Wheel as she Repairs it, and Talks to Girl. Girl Flicks her Hair as she Talks with Friend Outside House. Girl Fixes and Spins Bike Wheel. 1970s: Forest multiple use wheel spins. Categories Wood, Water, Forage, Wildlife, and Recreation appear. The wheel spins quickly. 1950s: Fingers spin roller skate wheel. Hand spins car tire. Hand spins bicycle tire. Pottery hands creating an earthen jar on a spin wheel. 1970s: Clear spinning wheel with red dots. Hand spins wheel. 1930s: Man pushes lever. Cogs, wheels, gears, and belts turn and spin. Man pushes lever, needle on gauge jumps up. 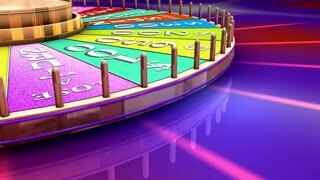 Man pushes button, wheel spins. 1970s: Wheel spins in zero gravity. Ice skater spins, pulling in arms and increasing speed of spin. Mechanic spin balance wheel tire machine shop DCI 4K 296. Automobile repair shop, fixes flat tire installs wheel. Worker spin balance to ensure a smooth ride. Heavy industrial equipment in busy garage workshop. Auto part installation. 1970s: Hand pulls string, causing wheel with red dots on inside to spin quickly. 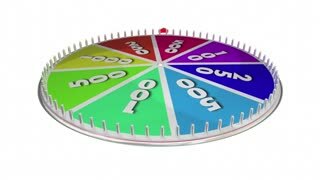 Screen splits, showing same wheel with red dots on outside spinning more slowly than original wheel. Close up of dirty and mud-splattered vehicle wheels turning and trying to gain traction against the stony road surface. The wheels spin and the car moves off. 1960s: Man on tractor pulls agricultural wheel rake over hill of cut hay grass. Rake wheels spin to pile cut hay grass. Auto mechanic shop worker balance a wheel DCI 4K 294. Automobile repair shop, mechanic fixes flat tire installs wheel. Worker spin balance ensure a smooth ride. Heavy industrial equipment busy garage workshop. Auto part installation ensure safety. Retro moped making wheel spin on ice. 1950s: Water flows to mill. Wheels spin. Water sprays. Men use saws to cut wood. Bike wheel spins in darkly lit bike shop. 1950s: Ball bearing wheel spins around metal axle. UNITED STATES: 1950s: blacksmith shapes metal with hammer. Hand works land. Hand spins wool on wheel.